Fiorentina and Atalanta play out a six-goal thriller in the first leg of their Coppa Italia semi-final. 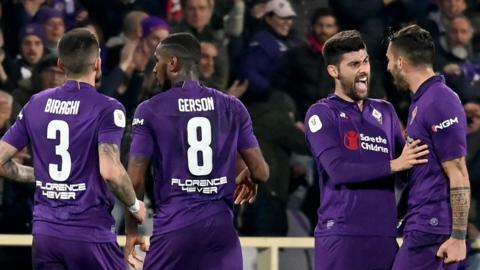 Jordan Veretout scores a 101st-minute penalty as Fiorentina draw with Inter Milan in late VAR controversy. Federico Chiesa scores a hat-trick as Fiorentina humiliated Roma 7-1 to reach the Coppa Italia semi-finals. Cristiano Ronaldo scores as unbeaten Juventus go 11 points clear at the top of the Serie A table by beating Fiorentina. Fans sing at the funeral of Italy and Fiorentina footballer Davide Astori in Florence.